Praise and glory to God, we have a match! 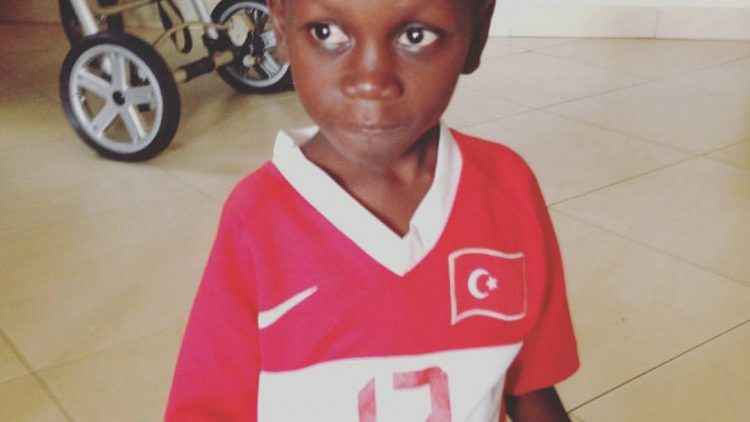 This is our son - Dacheley (Dach), he is around 6 years old and lives at an orphanage in Uganda. Dach is a loving little guy, and we need him to come home as soon as possible. He was severely malnourished when he was abandoned and only learned to walk just within the last couple of years. He has some developmental and learning disabilities that will require therapy and he does not speak. Even though we only have pictures of him so far, we couldn't imagine loving him more than we already do and we know with certainty that God has wonderful plans in store for Dach. Please help us overcome the financial burden of bringing him home! Waiting is the hardest part.... Dach is ready to come home and we are beyond ready for him to be here. When we started out on this journey, a little over a year ago, we knew that we certainly did not have the funds needed to bring our child home. We stepped out in faith and decided to put the financial aspect into our Savior's hands. He is working though those of you who have donated thus far - and we are INCREDIBLY thankful for each of you. Every child deserves a home and we will not rest until Dacheley has made it to his. In this season of waiting, time seems to stand still. Please join us in fervent prayer over Dacheley's well being and health in his living circumstances, our hearts and minds as we struggle through this tough season, and over each and every child waiting for their forever family to come to them. We are thankful for Adoption Bridge and the fact that all donations are PayPal friendly and are linked directly to our adoption agency... and are tax-deductible! Thank you for helping us bring our son home! UPDATE 5/31: We finally received our court date and have to be IN UGANDA ON JULY 6TH! We are so thrilled to be just 36 days away from MEETING OUR SON, but also incredibly overwhelmed with all that has to happen within those 36 days. It is IMPERATIVE that we raise these funds or we simply will not be able to travel. We have agency fees to cover as well as airfare and accommodations while in country. PLEASE GIVE as you feel led and SHARE this page- every little bit helps us bring Dacheley home to his family! As we anxiously await the notification of our travel dates to bring our Dacheley home, we desperately need to wrap up our fundraising efforts! If just 200 people each donated 50 dollars we could cover our remaining adoption fees and start booking airfare. Many hands make light work and we are so thankful for all of your support thus far. All donations made through our fundraising site are TAX DEDUCTIBLE and go directly to our agency (Nightlight Christian Adoptions). It's SUPER EASY and PayPal friendly. Please donate and SHARE this post to help us reach our goal of 200 people who help ‪#‎bringDachhome‬!! Bless you! I have 7 babies, 5 adopted! I know the struggles. May God be with you through each step! We're all hoping Dach comes home soon!! Best of luck on this journey! You are doing what I have always dreamed of doing! May God bless you and this sweet boy! Let's get this munchkin home. 10 down, 190 to go! Can't wait to maybe meet this boy with the family in person!!! Here's praying you can bring that sweet boy home soon! Since we can no longer celebrate with our son on his birthday, we thought it best be fitting to help bring your son home. We wish we could do more. We can't wait to meet him! We are adoptive parents too. We also fostered 3 Vietnamese boat kudos for 4 years. You will be richly blessed. Praying that God doubles every contribution! Cant wait to see pictures of Dach home!